------The weather forecast sounded bad - increasing cloudiness; chance of afternoon showers; northwest winds at 20 knots - not a good day to think of cruising first to the northwest and then southeast down a major Alaskan Channel, known for its rough weather - on a day when good visibility was paramount for success. -----We had had a long string of rainy days on our Alaska cruise with our son and grandson, and accompanied by Chris on Rana Verde. Things were getting damp aboard Halcyon, but the spirits were still high. It was time for a bright special day as a reward after the almost continuous rain. We were in Wrangell Harbor and had just lip-smacked our way through a great halibut dinner, caught by grandson Bryce and barbecued to perfection by Chris. Thoughts turned to the morrow. "Weather doesn't sound very good in Frederick Strait tomorrow," I ventured. "Too bad. 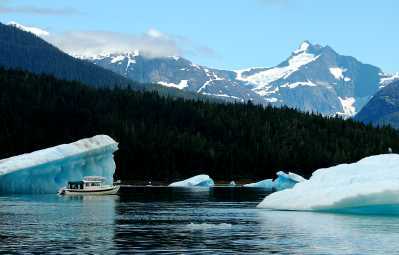 It would be great to get to the LeConte Glacier before the big Fourth of July celebrations in Wrangell." 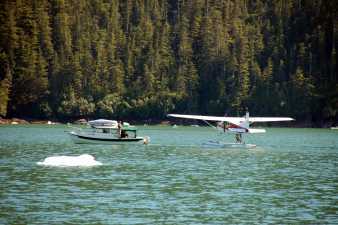 -----"Well, you never know about weather - hard to forecast up here, and maybe we can take our usual early morning sneak and get across the Sound before she kicks up." El is the optimist. ------What constitutes a perfect day? Probably as many answers to that question as there are people - and any one of us will have different answers depending upon whether life's going uphill, down, or over. But, we will all agree that there are some days simply more memorable than others. That next day was a no-question-about-it perfect day. -----We awoke a little after five. Like the groundhog, we stuck our nose out of our burrow and sniffed the air. "Looks good," I said. 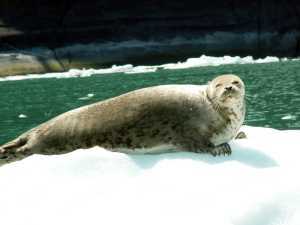 In a half hour we were under way across the Sumner Strait with light air on the bow. 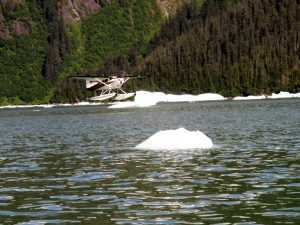 We had to push against the tide up the Narrows to Petersburg but it assured a slack water entrance into LeConte Bay. -----We stopped at the fuel dock in Petersburg. 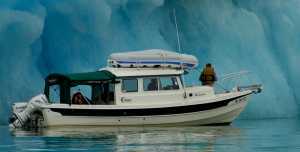 "Jet boat was into LeConte this morning - choked with ice, they said," the dock attendant stated flatly. "You won't get in with your prop boat." ------The sky had turned gray and threatening. Clouds covered the peaks in gray, scudding, smears of wetness. It was noticeably colder in Petersburg than Wrangell. The weather forecast was proceeding according to schedule. "Don't know," I ventured. "Maybe we should save the fuel and just hang out for the day in Petersburg - it's a nice town." -----"Weather changes quickly here," El said with a smile, "Let's give it a try. The icebergs have a better shade of blue on gray days." 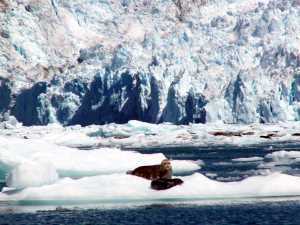 ------There is a terminal moraine across the mouth of the bay, ten miles from the face of the glacier. The moraine is the former terminus of the glacier. 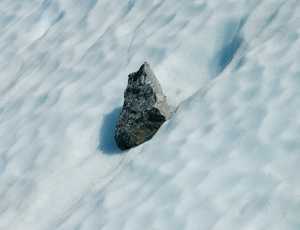 Through thousands of years, glacial ice carried millions of tons of ground-up rock and dumped that lithic trash unceremoniously into a pile at the end of the glacier. -----Now the sea has flooded that valley creating a fiord, but the moraine remains, barely under the sea. Water depths are 20 feet at low tide, compared with hundreds of feet on either side. The channel is narrowly constricted by house-size boulders, gravel and sand into a shoal with rock fangs. 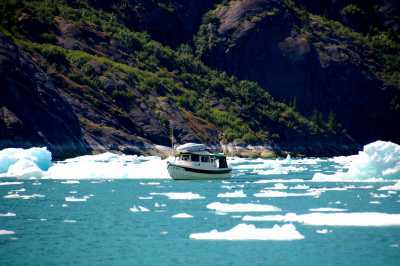 Ice bergs, calved from the glacier, float down the fiord and lodge against the moraine, creating an ice dam for smaller bergs and the exploring boat. 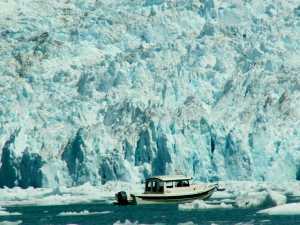 Many folks get a picture of their boat in front of a grounded berg ten miles from the glacier face and safely continue on their way. 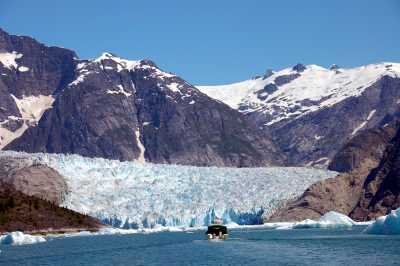 ------Three years ago, at about the same date, we had tried to enter LeConte Bay to see this southernmost tidewater glacier on the continent. We were able to slide through a narrow slot in the moraine-ice barrier and up to within four miles of the face before we were forced to stop by ice choking the entire fiord. We never saw the glacier, around a few more sharp bends in the bay. 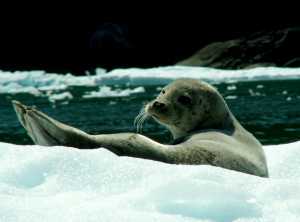 The fiord was incredible, the seals fascinating, and the shapes and forms of ice marvelous - worth the risky sneak through the ice dam. We photographed what we saw, retreated, and continued northerly. 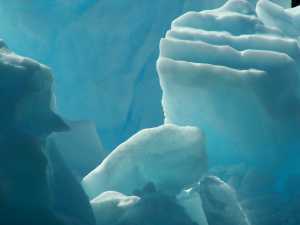 At Sawyer Glacier in Tracy Arm, we shared the incredible experience of the face of a calving glacier up close and personal. ------This year, after the report we heard in Petersburg, we thought it might not even be possible to get past the berg dam at LeConte. However, as we approached the bay, the clouds lifted. Sunlight flooded the peaks of the Coast Range, highlighting brilliant spires against deep blue sky. 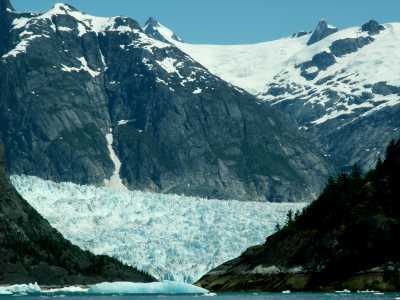 ------Incredulous, we turned the bend into the fiord and stared in amazement - there was no ice dam! 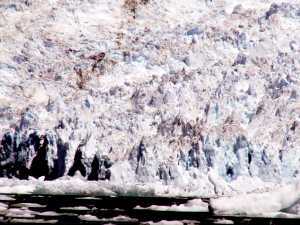 Only a few large, grounded, well-worn bergs blocked the sides of the channel. The door was open! 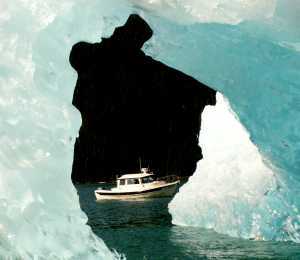 ------Now to see if bergs inside blocked our passage. We slipped by the guardians of the gate - no! 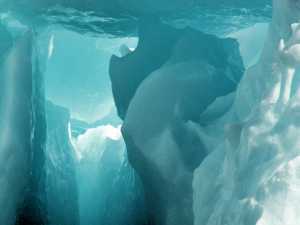 Inside bergs were scattered and there was ample room in and around them. 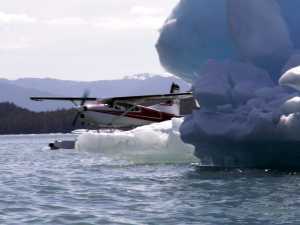 We proceeded cautiously, watching for the bergy bits that might clip off a prop. We passed our former turnaround point and the route ahead through the icebergs was possible! 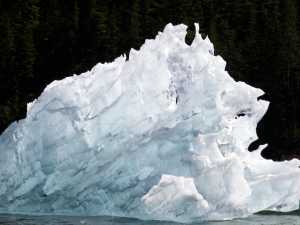 ------Photographing bergs, birds, and pupping seals, we crept through the ice. There, around the last bend, was LeConte Glacier - in sunlit glory. ------We crept to within three tenths of a mile to the calving face - as close as we dared - and shut off the engines. For hours we drifted in the ice, watching the face calve massive cliffs of ice with thundering roars, and feeling the swell of giant waves pass under our boat. 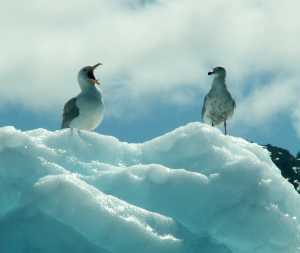 Icebergs ground together in the well, seals squealed, pups cried, gulls mewed, and groans of moving ice echoed through the valley. It was a day we will all remember - a perfect day. ------Sculpture is one of our favorite forms of art and the skill of nature in fashioning materials has never been exceeded by the hands of man. 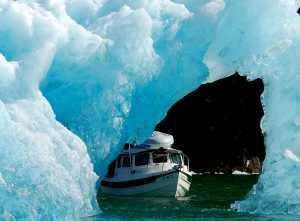 The bergs floating around us intrigued us and held us captives of their beauty. ------The air was sometimes full of the sound of infants, crying. This is a sound that causes a reflex action, especially from parents. We instinctively searched for the source of distress. 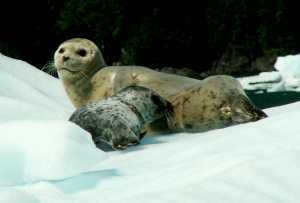 We soon discovered it was the mewing of hundreds of Harbor Seal pups, recently born on the ice floes near the glacial face. 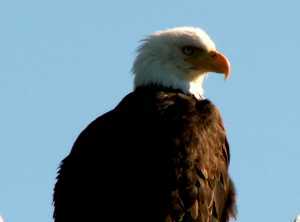 ------Our son, Brad, is a biologist with a lifelong interest in birds. 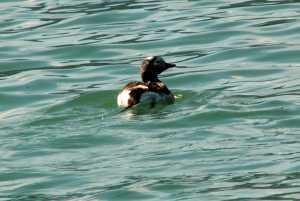 We are also avid birders, so naturally our cruise up the fiord was somewhat delayed by avian visits. 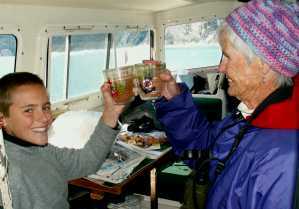 ------On the cruise out of the fiord, Grandson Bryce waved to a passing float plane. The pilot made a sharp turn and descended for a landing. Deftly dodging bergs he disappeared behind an especially large one. "Oh, oh - Maybe he thought we were waving because we have a problem," Bryce said with a worried frown. ------The plane taxied around the end of the berg and we headed over to it. Heather and Lee, from Surrey, BC were flying up the coast, celebrating their 20th Anniversary. They passed us their camera. We towed their drifting plane away from the ice, and we were soon taking Anniversary photos. 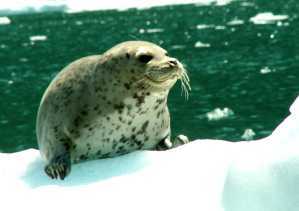 ------As they passed us overhead, while we and they were leaving LeConte Bay, they radioed a thanks and bon voyage. ------We were soon pounding head-on into a high sea pushed by those promised twenty knot winds. It was going to be a slow, wet, rough passage back to Petersburg. "Willing to risk a run though Dry Strait?" El radioed to Chris, on Rana Verde. 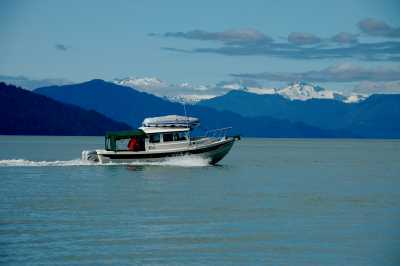 Dry Strait is a true shortcut back to Wrangell from LeConte. It is about 19 miles to Wrangell through the Strait and 63 via Petersburg. However, as the Donner Party discovered, short cuts often come with risk. Dry Strait is uncharted and cruising guides say something like, "Don't even think about it." You know - the ol' local knowledge thing. ------"I dunno," Chris radioed back. "Kinda risky. Why don't you read again what the guides say. Maybe there's a sneak?" El read a passage titled, Dry Strait - Good Judgment or Lack of Courage? The author turned back. ------"Tide's high," I offered. "If we can ever get through, should be now. Sure easier with the wind astern than pounding our way against Frederick." 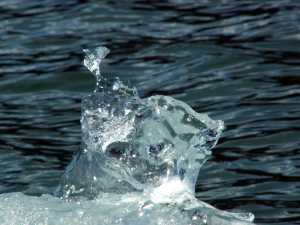 ------"Tide's high," the radio crackled an echo from Chris. "Let's go." ------Well, we went - and the beginning of the southerly ride was easy with the lumps astern. But, about the eastern point of Mitkof Island the route was uncertain. This is the delta of the Stikine River, a notoriously silty river that dumps tons of sediment across anastomosing channels throughout the delta. The sand bars change very day. We had an old chart, we knew would be inaccurate, but it was the best we had. A skinny blue route wandered through a large patch of green - a former channel through the tidal flats. We had no option but to give it a try. We were soon plowing into mud - the old route was no more. We ran aground into silt beds twice more before we decided to ease back and 'sniff' out a route across the green patch of shallows noted on the old chart. We found it - with four foot depths, and we were at the crest of an eleven-foot high! ------Soon we were around the point and on our way toward the Sumner and home. It takes a little yin to sweeten the yang of a perfect day.